Prof Elize van Eeden, chairperson of the subject group, says that history seems to have gained popularity as the number of enrolled students taking the subject as part of a qualification across the three campuses has almost doubled since 2015. In the first-year group Nonhlanthla Mazibuko took top honours in both the first and second-semester modules. In the second-year group the first semester was dominated by Kgagamatso Nhlapo and the second semester by Ruchundré Reid. Onalenna Pheko was the top performer in the third-year group for the first semester, and Philani Dlamini was at the top of the log for the second semester. 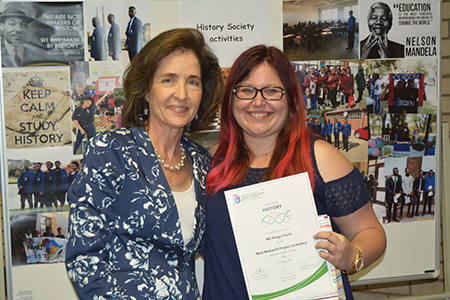 The top honours student of the year was also recognised: Kinga Siejek passed her degree with distinction with her mini-dissertation entitled “From Poland to Vanderbijlpark: Cause and reflection of immigration during 1980-1990”. The highlight of the evening was the introduction of the new History Society Executive who will be led by Themba Phukane in 2018. Prof Elize van Eeden with top honours student, Kinga Siejek.